The Adventure Backpack is a mod by Javier Darkona. A mod that adds an interesting twist to the meaning of wearing a Backpack that can also be placed when the Player gets tired carrying it, with a broad selection for all taste and preferences. The collection of over 60 Backpacks offer distinctive functionality and some even have a special ability. The mod also offers some accessories, tools and a few unique items. All items can be crafted with vanilla materials making this mod independent. Some of the unique functionalities are a quick tool swap and built-in fluid storage (with an optional hose attachment to spray or drink), sleeping bag and crafting table. 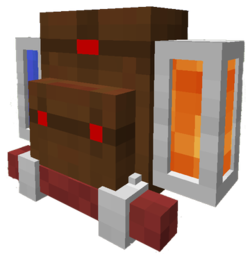 The Backpacks preserve the contents upon the death of the Player and are impervious to Lava and explosions when placed. This page was last modified on 22 November 2015, at 10:54.